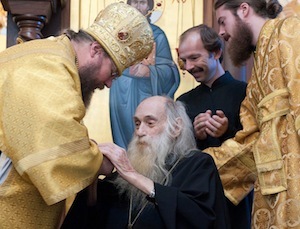 Metropolitan Jonah with Archbishop Dmitri in late August. His Eminence, the Most Reverend Dmitri, 87, retired Archbishop of Dallas and the Diocese of the South, fell asleep in the Lord at his home here at 2:00 a.m. Sunday morning, August 28, 2011. His Beatitude, Metropolitan Jonah, and many priests and faithful had kept vigil in Dallas during Archbishop Dmitri’s final days. The Metropolitan was to have traveled to the Czech Republic with a delegation from the Orthodox Church in America, but remained in Dallas to be with the Archbishop. Funeral services will be celebrated at Dallas’ Saint Seraphim Cathedral — the parish Archbishop Dmitri founded as a mission shortly after his ordination in 1954. Days and times will be posted at oca.org as they are received. Consecrated to the episcopacy in 1969, Archbishop Dmitri’s ministry spanned 57 remarkable years. Archbishop Dmitri was born Robert R. Royster into a Baptist family in Teague, TX on November 2, 1923. He often credited his mother with providing him and his sister with a strong, initial faith in Christ. After discovering Orthodox Christianity as teens, he and his sister asked their mother for a blessing to convert, whereupon she asked one basic yet predictive question: “Does the Orthodox Church believe in Christ as Lord and Savior?” As it turned out, a specific emphasis on the person and work of Jesus Christ became the hallmark of the future hierarch’s ministry, profoundly influencing his preaching and writing. The Archbishop would later recall that an Orthodox clergyman and mentor advised him early on in his priesthood to include always the name of Christ in every conversation, to make Him the focus of every sermon. Having received their desired blessing, and after a period of enquiry and study, he and his sister were received together into Orthodox Christianity at Holy Trinity Greek Orthodox Church, Dallas, in 1941. It was at that point that the two received the names Dmitri and Dimitra. Dmitri was drafted into the US Army in 1943, after which he underwent intensive training in Japanese and linguistics in Ann Arbor, MI, and the Military Intelligence Service Language School in Fort Snelling, MN. He later served as a Japanese interpreter at the rank of Second Lieutenant on the staff of General Douglas MacArthur. He was required to undergo the usual training given to all soldiers and was recognized, interestingly enough, as an expert marksman. He was blessed with a strong constitution and good physical abilities; as a teenager, he represented his high school in the state tennis semi-finals. Later, as hierarch, he would comment that good health and physical strength should also be used in service to Christ. Following his own advice, he pushed himself physically, traveling repeatedly by car for years, from one end of his 14-state diocese to the other in the early stages of its inception, visiting parishes and founding missions. After his military service, he completed his education, receiving a Bachelor’s Degree from the (now) University of North Texas in Denton, and a Master’s Degree in Spanish in 1949 from Southern Methodist University. He completed two years of post graduate studies at Tulane University in New Orleans, whereupon he returned to his home in Dallas. A prolific author, translator, and editor, Archbishop Dmitri wrote numerous Scripture commentaries and other books on a wide variety of subjects. In 1954, as a subdeacon with the Ukrainian Orthodox Church under Constantinople, he worked with the Mexican Orthodox Community of Our Lady of San Juan de Los Lagos, at which time he began translating Orthodox liturgical services into Spanish. In April 1954, Subdeacon Dmitri, his sister Dimitra, and their priest, Father Rangel sought a blessing from His Grace, Bishop Bogdan, to establish an English-language Orthodox mission in Dallas – the future Saint Seraphim Cathedral. He was ordained to the diaconate and priesthood later that year and assigned rector of Saint Seraphim’s. In 1958, permission was sought and given to bring both Father Dmitri and the parish into the Metropolia, as the Orthodox Church in America was known at that time. During his pastorate, he served as a Spanish instructor at Southern Methodist University – a position he held for a number of years. He also taught at Tulane University in New Orleans for a brief period during his tenure as student. During the early years of Saint Seraphim’s, Father Dmitri continued his missionary activities among Mexican Americans, but was intent on developing the new community placed in his care. As a direct result of his desire that people from all walks of life hear the message of Orthodox Christianity, the cathedral remains to this day a multi-ethnic parish, consisting of both life-long Orthodox Christians as well as converts. While functioning as priest and university instructor, Father Dmitri also found time to help his sister with her restaurant. As children, responsibilities in the family restaurant provided an appreciation for the art of cooking. As adults, the two came to be regarded as gourmet chefs. Not surprisingly, celebrations at the Archbishop’s home in honor of specific religious holidays were awaited with great anticipation by members of the Church and local Dallas clergy. Following the teaching of Saint Paul, he was enthusiastically “hospitable” [1 Timothy 3:2]. At such gatherings, the Archbishop sometimes would recall certain struggles of the Depression. He did not dwell on the subject, but it seemed that the experience of going without, of laboring to put food on the table, was never far from his consciousness. He lived modestly and was generous to a fault, not only giving beyond the tithe to his cathedral, but donating to seminaries, charities, diocesan missions, and persons in need. 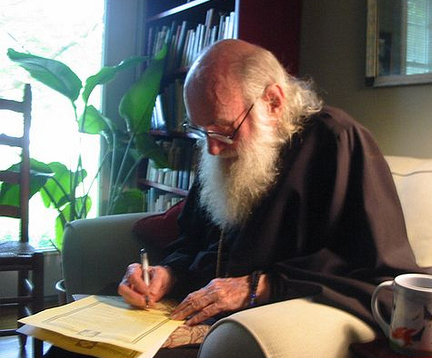 While working outside the Church and tending to priestly responsibilities, Father Dmitri found time to print his own original articles in a weekly Church bulletin. In the 1950s and 60s, Orthodox theological works in English were sparse, especially on a popular level of reading. He saw a need and sought to address it. Later, the curriculum for catechumens he used at Saint Seraphim’s would be published by the Department of Christian Education of the Orthodox Church in America, with the title, Orthodox Christian Teaching. The Dallas community grew steadily. He had a unique gift for relating to all people, and young and old alike looked to him as a loving father. From 1966 to 1967, Father Dmitri studied at Saint Vladimir’s Seminary, while concurrently teaching Spanish at Fordham University. He studied with people like Protopresbyters Alexander Schmemann and John Meyendorff and Professor Serge Verhovskoy. In 1969, he was elected to the episcopate, and was consecrated Bishop of Berkeley, CA as Auxiliary to His Eminence, Archbishop John [Shahovskoy] of San Francisco on June 22 of that year. His consecration is regarded by some historians as the first consecration of a convert to the episcopate in America (although another individual, Ignatius [Nichols], had been consecrated in 1932, but subsequently left the Church). In 1970, he was reassigned as Bishop of Washington and Auxiliary to His Beatitude, Metropolitan Ireney. He would later recall the helpful training he received as an Auxiliary under both Archbishop John and Metropolitan Ireney, especially his many hours of instruction in Church Slavonic. Archbishop Dmitri with Mexican clergy during one of his many visits to Mexico City’s Ascension Cathedral. On October 19, 1971, Bishop Dmitri was elected Bishop of Hartford and New England. In 1972, the Holy Synod of Bishops brought Mexico under the auspices of the Orthodox Church in America, which had received its autocephaly in 1970 from the Moscow Patriarchate. Given his knowledge of and fondness for Mexican culture and the Spanish language, Bishop Dmitri was given additional responsibilities by the Holy Synod as Exarch of Mexico. He was as much beloved by the Mexican people as by those in his own Diocese. In 1977, at the 5th All-American Council of the Orthodox Church in America in Montreal, Bishop Dmitri received a majority of popular votes in the election for a new Metropolitan. For the sake of continuity – at that time, a life-long Orthodox Christian occupying the Office of Primate See was seen as more in keeping with the challenges of a young territorial Church – the Holy Synod chose instead His Grace, Bishop Theodosius [Lazor] of Pittsburgh and Western Pennsylania, who became an advocate and supporter of missionary work in the southern United States. In 1978, the Synod of Bishops took the important step of creating the Diocese of Dallas and the South. Bishop Dmitri became its first ruling hierarch, taking Saint Seraphim Church as his Episcopal See. Christ the Saviour Church, Miami, FL, a prominent community in the South, became the second cathedral of the newly formed Diocese. Archpriest George Gladky, a veteran missionary and rector of Christ the Saviour, was named Chancellor. He and Bishop Dmitri worked admirably with others to establish churches and teach the faith in a region of America in which Orthodox Christianity was relatively unknown. The first Diocesan Assembly of the South was held in Miami August 25-26, 1978. Archbishop Dmitri with Bishops Alejo, Tikhon, and Benjamin at the consecration of Archimandrite [now Metropolitan] Jonah to the episcopacy. On September 4, 2008, following the retirement of His Beatitude, Metropolitan Herman, the Holy Synod named Archbishop Dmitri Locum Tenens of the Orthodox Church in America. His Eminence, Archbishop Seraphim [Storheim] assisted him as Administrator. In November 2008, Archbishop Dmitri’s role as Locum Tenens ended with the election of His Grace, Bishop Jonah [Paffhausen] of Fort Worth as Metropolitan. On March 22, 2009, the Archbishop requested retirement from active ministry as a diocesan Bishop, effective March 31, 2009. Under his leadership, the Diocese of the South grew from a dozen communities to its present 70-plus parishes and missions. After his retirement, Archbishop Dmitri lived peacefully at his home, writing, making occasional visits to diocesan communities, and maintaining a quiet involvement with the life of Saint Seraphim Cathedral. He was blessed in his last days to have many parishioners who visited and cared for him at home 24 hours a day, as well as medical professionals who came to his bedside to treat and evaluate his condition. The community in turn received a great blessing from the love and courage with which the Archbishop welcomed them and approached his illness. He remained courteous, hospitable and dignified throughout, even attending Church when his strength allowed. These unexpected visits to the cathedral by the Archbishop were sources of joy and inspiration to the faithful. For his former Diocese and the Orthodox Church in America, Archbishop Dmitri leaves a progressive vision of evangelism and ecclesial life, a solid foundation upon which to develop future communities and schools. He leaves the faithful the experience of having had a compassionate father whose enthusiasm was contagious, inspiring many to look profoundly at their own vocations in the Church. Archbishop Dmitri’s greatest joys – as well as sorrows – were connected to his episcopal ministry. The establishment of new missions, the ordinations of men to the priesthood or diaconate, and the reception of others into Orthodox Christianity, were continual sources of delight. He patiently dealt with clergy and laypersons who needed correction. In fact, it would be difficult to recall an instance in which he strongly reprimanded anyone, at least publicly. Private, gentle advice when needed was more “his style.” At times, his approach confused and frustrated some who believed that his manner of oversight should be stricter, or that he should be more demanding in his expectations. But this was never his way. It was not in his character to remind people bluntly of their responsibilities. He chose to lead by example rather than by decree. Ultimately and personally, this became a source of his extraordinary influence and popularity. Mere suggestions were readily received as directives because of people’s fondness for him. More than once the comment was made, “you cannot buy that kind of authority” – authority that proceeds from integrity and proven dedication, from a loving relationship between a father and his children. As stated, Archbishop Dmitri’s episcopacy was strongly characterized by a single-minded devotion to the person and work of Jesus Christ. His publications are a testimony to his dedication, and include books titled The Sermon on the Mount, The Parables of Christ, The Miracles of Christ, St. Paul’s Epistles to the Romans and to the Hebrews, The Epistle of St. James, and The Gospel of St. John. His works also include the aforementioned Introduction to Orthodox Christian teaching, as well as A Layman’s Handbook on The Doctrine of Christ. Some of these have been translated into other languages, enthusiastically received as instructional tools by the faithful abroad. When asked to document his personal thoughts concerning evangelism or American Orthodoxy, the Archbishop consistently hesitated, preferring instead to dwell on the teachings of the Fathers regarding Scripture and Church doctrine. For many years, Archbishop Dmitri served as editor of the first diocesan newspaper in the Orthodox Church in America, The Dawn. This modest publication was a primary means of education and an instrument of unity among members of a diocese that spanned over one million square miles. One full page in every issue of The Dawn featured his Spanish-language translations. Later, he included a page in Russian to minister to the needs of new immigrants. 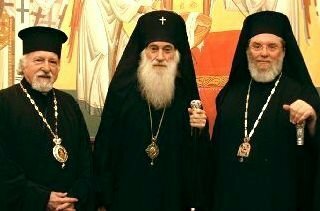 Archbishop Dmitri with Greek Metropolitan Isaiah and Antiochian Bishop Basil on the Sunday of Orthodoxy 2009. The dignity that Archbishop Dmitri brought to his episcopacy was well known. People commented on his bearing, the way he carried himself as a Bishop of the Orthodox Church. Some found it surprising that such an august figure possessed great love and respect for others, and that he presented himself as one of the people. Without exaggeration, it can be said that he was a rarity, a unique combination of faith, talent, intelligence and charisma. For the Diocese of the South – indeed for the Orthodox Church in America – he was “the right person at the right time.” Throughout the 42 years of his episcopal ministry, every day was offered in service to Christ, with Whom he now enjoys the blessedness of the Kingdom. We pray for his continued prayers, and we thank the Lord for having given His flock the gift of Archbishop Dmitri. May Archbishop Dmitri’s memory be eternal!